It’s summer and we’re excited! Not because of the heat, the reason for our excitement is the seasonal fruit, watermelon. Beating the heat becomes easy if you stay hydrated. The sun sure is relentless, hence you should be aware of the health benefits of watermelon and the benefits of watermelon juice. 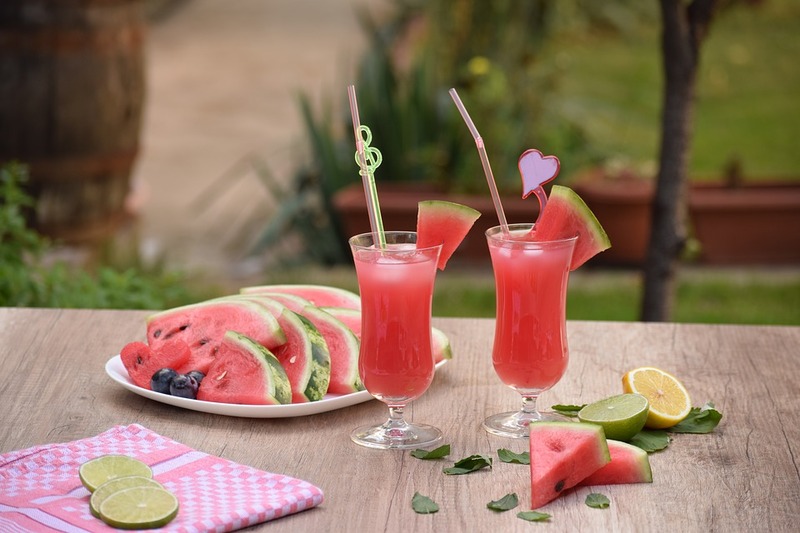 Therefore, in this article, we will discuss not only the health benefits of watermelon, but the benefits of watermelon juice as well. We’ll also take you through some interesting facts and recipes in which you can add watermelon and enjoy its benefits. What Makes Watermelon A Healthy Fruit? The health benefits of watermelon and the benefits of watermelon juice are attributed to the nutritional facts of a watermelon. A rich source of essential vitamins and minerals like vitamins A, B, and C, watermelon also has antioxidant properties. It is because of this antioxidant which goes by the lycopene, the flesh of the watermelon is rendered red in color. For the calorie conscious people, watermelon has less than 0.15g of fat in a 100g serving and about 46 calories. You can consume up to 12 mg of vitamin C in a serving of 100g of watermelon. What Are The Health Benefits Of Watermelon? By now you must be curious about the health benefits of watermelon also if there are any benefits of watermelon juice. While the list could probably be endless we have compiled the top 20 benefits of watermelon. Watermelon’s high water content helps this fruit to reduce the bad cholesterol in the blood which is linked to many heart diseases. Since it stops bad cholesterol from accumulating, it also stops fatty tissue from being deposited in the blood vessels. Watermelon is a rich source of an amino acid called citrulline. This amino acid is taken as a sports supplement which is good for the heart. Inflammation is the condition in which a part of the body becomes reddened. As mentioned earlier, the antioxidant called lycopene, not only adds to the redness of the watermelon, but also to the health benefits of watermelon. When you say “watermelon” the first word to come out of your mouth is water. An average watermelon is comprised of almost 90% water making it a good source of hydration. A cool piece of watermelon is sweet and refreshing but at the same time hydrating as well. Cancer-fighting properties is another of the health benefits of watermelon. Antioxidants have cancer-fighting properties, and the lycopene found in a watermelon is a good antioxidant. In about 100 g of watermelon, there is about 20 mg of lycopene. Studies have shown that lycopene is chemopreventive and especially helps in fighting prostate cancer. Related Reads: Antioxidant Foods India. HPV or human papillomavirus is linked to causing genital warts. Because of lycopene again, among the benefits of watermelon, fighting HPV is also a part. The nutritional facts of watermelon state that it contains important electrolytes and amino acids like citrulline. After a hard workout, you may leave the gym with sore muscles and still feel the soreness for maybe another day or two. Muscles soreness is caused by too much buildup of lactic acid, also responsible for muscle cramps sometimes. Muscles soreness can be treated with the amino acid present in the watermelon called citrulline. Water is considered to be good for the digestive system. Hence consumption of watermelon can help with the digestion process. The fiber content of the watermelon also is a plus with regards to digestion. A cool piece of watermelon can help with heartburns during pregnancy. Mothers suffering from morning sickness can enjoy the taste as well as the health benefits of watermelon juice. According to a study conducted on a few patients suffering from asthma, watermelon proved to be therapeutic in nature. The showstopper is the antioxidant lycopene, it helps to reduce the asthmatic flare-ups in both children and adults. A study conducted on a set of volunteers showed that one of the benefits of watermelon juice is that it can keep the blood pressure under control. The citrulline present in watermelon is closely related to arginine which gives it the magical power of controlling blood pressure. Rich in potassium is also an added benefit of watermelon for fighting blood pressure. Related Reads: Foods To Avoid With High Blood Pressure. Staying hydrated is proven to reduce skin issues like acne, and watermelon being rich in water content helps with treating skin problems. For hair, the high Vitamin C in watermelon helps in treating hair problems. Vitamin C to the rescue again, consuming watermelon is linked with improving bone health. Among the health benefits of watermelon, we can also add the fact that it helps in preventing osteoporosis and bone fracture. Low in calories and fat watermelon is a good option for people trying to lose weight. The high water content also boosts up the metabolism again aiding the process of weight loss. For kidney patients foods with potassium considered harmful. Even though watermelon has potassium it is still lower compared to other sources. Consuming watermelon helps kidney patient in staying healthy. We already know that the health benefits of watermelon or the benefits of watermelon juice can be attributed to the vitamins and other essential nutrients found in it. These vitamins also help in strengthening the immune system. Vitamins aid in the production of RBC (red blood cells) which keeps the immune system strong. Related Reads: Vitamin D Rich Foods. The health benefits of watermelon juice including helping people fight diabetes. Studies have shown that even though watermelon falls under the foods with high glycemic index, they are still believed to carry anti-diabetic properties. But you should still seek a doctor’s advice before binging on watermelons. Lycopene is linked with protecting the body against free radicals and infections. This ultimately helps in preservation and protection of cells from being damaged. The significant amount of water in a watermelon prevents the body from suffering from heatstroke. Presence of high amount of vitamin A in the watermelon is a health benefit of watermelon helping it fight gum problems. Vitamin A protects the gums against the buildup of bacteria in the mouth and by doing so it keeps the gum problems away. The summer heat can leave you feeling weak by the end of the day. Consuming watermelon helps revitalize the body and leaves you feeling energetic for a long time. Its electrolytic properties because of potassium, add to health benefits of watermelon. You can consume watermelon as a whole or in the form of juice, if you consume it in the form of juice here are a few benefits of watermelon juice. The first among many benefits of watermelon juice is that it has anti-aging properties attributed to lycopene found in the watermelon. A glass of freshly pressed watermelon juice is a proven home remedy for diseases like osteoarthritis, asthma, and colon cancer. Watermelon Selection 101: How Do You Know If A Watermelon Is Ripe? To enjoy the health benefits of watermelon juice or a whole watermelon, you need to make sure that you pick a good watermelon first. Let’s take a look at signs which tell you if the watermelon is ready to eat. Make sure that the watermelon is firm and without any bruises or dents. The 90% water content makes a watermelon heavy to carry, another sign you should look for in a good watermelon. Look for a yellowish spot under the watermelon, it should be right on the spot where it was sat. A ripe watermelon has a dark green hue indicating that it is ready to be eaten. Also, read about: Foods That Lower Cholesterol. Watermelon is not only refreshing and healthy but also a tasty fruit, the added benefits of watermelon juice makes it a powerful source of staying healthy. So we’ll end the article with a quote of our own about benefits of watermelon, “Water water everywhere, with every single drop you can drink”.